Extensive clinical experience has shown that systemic interleukin (IL)-2 administration can induce complete or partial regression of renal cell cancer (RCC) metastases in 15 to 20 % of patients. Since IL-2 has no direct anti-cancer effects, it is believed that cancer regression is mediated either by a direct modulation of immune cell effector functions or through the mediation of soluble factors released as a result of IL-2 administration. We previously observed that transcriptional and protein changes induced by systemic IL-2 administration affect predominantly mononuclear phagocytes with little effect, particularly within the tumor microenvironment, on T cell activation, localization and proliferation. It further appeared that mononuclear phagocyte activation could be best explained by the indirect mediation of a secondary release of cytokines by IL-2 responsive cells either in the circulation or in peripheral tissues. To better characterize the cytokine outburst that follows systemic IL-2 administration we followed the serum levels of 68 soluble factors in ten patients with RCC undergoing high dose (720,000 IU/kg intravenously every 8 hours) IL-2 therapy. Serum was collected before therapy, 3 hours after the 1st and 4th dose and assayed on a multiplexed protein array platform. This study demonstrated that 1) the serum concentration of more than half the soluble factors studied changed significantly during therapy; 2) changes became more dramatic with increasing doses; 3) subclasses of soluble factors displayed different kinetics and 4) cytokine patterns varied quantitatively among patients. This study shows that the cytokine storm that follows systemic IL-2 administration is complex and far-reaching inclusive of soluble factors with disparate, partly redundant and partly contrasting effects on immune function. Therefore comparing in parallel large number of soluble factors, it sets a comprehensive foundation for further elucidation of "cytokine storm" in larger patient pools. Based on this analysis, we propose a prospective collection of serum samples in a larger cohort of patients undergoing IL-2 administration with the purpose of discerning patterns predictive of clinical outcome and toxicity. Although, it has been postulated that IL-2 acts through the in vivo expansion and activation of cytotoxic T lymphocytes  and/or the promotion of their migration within target tissues , it is likely that at the pharmacologic doses used therapeutically IL-2 has broader immune/pro-inflammatory effects [4, 5]. Thus, the mechanism(s) through which systemic IL-2 administration mediates cancer regression remains unknown. It is also unknown whether the substantial toxicity associated with IL-2 administration (that limits its therapeutic usefulness)  is mediated through pathways common or distinct from those mediating its anti-cancer effects . It has been observed that hematological toxicity induced by IL-2 (thrombocytopenia and lymphopenia) is associated with increased frequency of clinical responses . In addition, reversal of IL-2-induced toxicity by corticosteroid or anti-TNF-α antibodies blunts its therapeutic effects suggesting a proinflammatory nature for this association [9, 10]. Yet, these and other associations between therapeutic and toxic effects are weak and inconclusive and in all probability different pathways may mediate the two phenomena. Obviously, the ability to segregate the anti-cancer effects of IL-2 in target tissues from its systemic toxic effects may be central for the development of improved anti-cancer therapies . 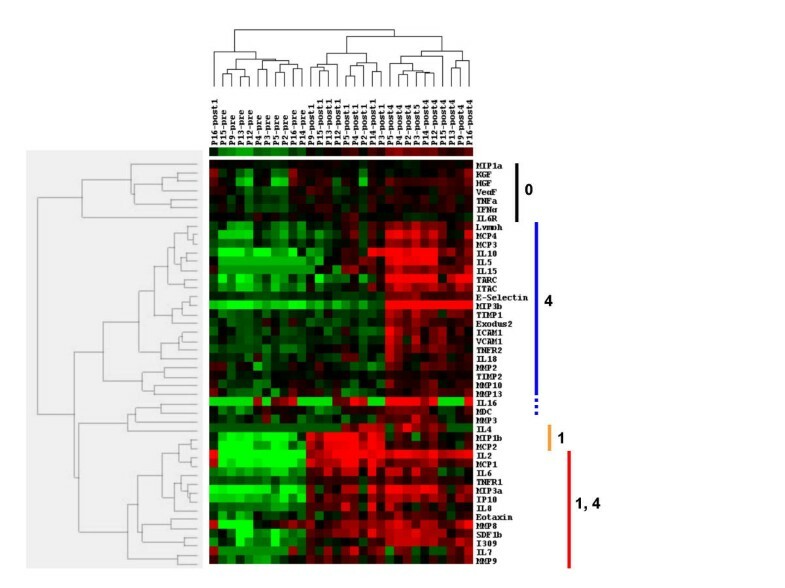 We have recently analyzed changes induced by the systemic administration of IL-2 on the transcriptional profile of circulating mononuclear cells and melanoma metastases . This was done by comparing samples obtained before therapy and three hours after IL-2 administration, a time point found to be most informative based on preliminary time course studies. Samples were serially obtained through blood draws and fine needle aspirates of melanoma metastases following a previously validated RNA amplification procedure . This study suggested that the systemic effects of IL-2 administration diverged from those identifiable within the tumor microenvironment since in the latter they seemed primarily restricted to the activation of mononuclear phagocytes. In fact, systemic IL-2 administration had very little direct effects on lymphocyte activation or migration to the tumor site, nor had direct effects on the survival of tumor cells. More specifically, it appeared that IL-2 induced activation of resident mononuclear phagocytes into mature antigen presenting cells. In addition IL-2 induced activation of cytolytic mechanisms and a massive production of chemo-attractants that could secondarily recruit other immune cells. In addition, the hypothesis that the direct or indirect effects of IL-2 in the target organ are mediated through mononuclear phagocyte activation is in line with the recently reported observation that macrophage activation by IL-2 is essential for tumor regression . In vitro testing failed to identify IL-2 as the direct agonist responsible for the activation of mononuclear macrophages (unpublished observation) suggesting that a down-stream cascade of immune modulators produced by IL-2-responsive cells in vivo might be the principal mediator of the effect of this cytokine on the tumor microenvironment. Since it is unlikely that IL-2 directly mediates all of the effects observed after its systemic administration, we hypothesized that the changes in the transcriptional program of melanoma metastases were most likely resulting from an array of soluble factors secondarily produced by IL-2 receptor-bearing immune cells. 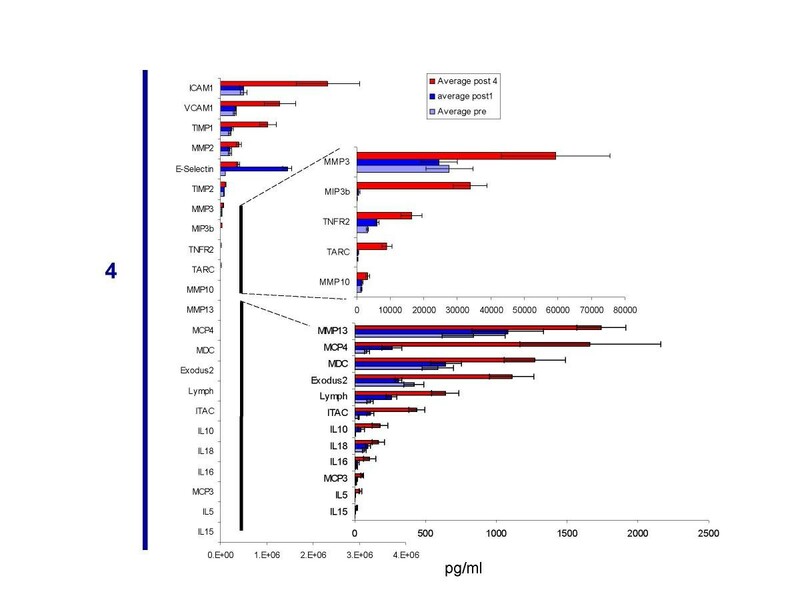 Indeed, a preliminary in vitro analysis of supernatants from cultures of circulating mononuclear cells exposed to IL-2 revealed an intense production of a broad array of cytokines and other soluble factors . The cytokine cascade or cytokine storm induced by systemic IL-2 administration has been extensively reported in the past and attempts have been made to associate individual parameters with biological effects [16,-19]. However, these studies were limited by the number of cytokines tested whose selection was based on an educated guess of their relevance to immune modulation. Recent advances in high-throughput analysis of gene and protein expression allow, however, a global and unbiased overview of complex biological processes adding novel dimensions to the study of this problem. Here we studied the serum levels of 68 soluble factors including cytokines, chemokines, growth factors, soluble receptors and metalloproteinases in patients with RCC undergoing systemic IL-2 therapy. The 68 soluble factors were assembled in a protein array platform (Searchlight™, Boston, MA) without predetermined bias except for their known or suspected relevance to immune phenomena. This was done with two main purposes: the first was to attain a general estimate of the ratio of biologically active factors induced by systemic IL-2 administration out of a pool of randomly chosen reagents. This parameter yields a rough estimate of the complexity and lack of specificity of systemic IL-2 treatment. The second was to provide a map of cytokine secretion patterns relevant to clinical IL-2 administration that could help forecast its toxic or beneficial effects in future prospective studies. The results suggested that 1) the serum concentration of more than half the soluble factors studied changed significantly during therapy; 2) changes became more dramatic with increasing doses; 3) subclasses of soluble factors displayed different kinetics and 4) cytokine patterns varied quantitatively among patients. Serum was collected from 16 patients (Table 1 and Table 2). From 15 patients, samples could be obtained before treatment and 3 hours after the 1st dose. However, in only 10 patients could the pre-determined collection be completed by obtaining serum before therapy and 3 hours after the 1st and 4th dose of IL-2. Time points of serum collection were selected based on previous experience suggesting incremental effects of IL-2 administration with increasing doses . It was felt the four doses represented a reasonable midpoint of IL-2 therapy that could be achieved in most patients before interruption of treatment due to limiting toxicity. Serum collections were obtained 3 hours after IL-2 administration because it is around this time that most of the systemic signs of IL-2 administration are apparent suggesting that the highest levels of soluble factors are reached around that time point. Serum was immediately separated to avoid protein degradation and stored frozen. All serum samples were thawed simultaneously at the completion of the study and immediately tested for the presence of 68 soluble factors (including chemokines, cytokines, soluble cytokine receptors and cell surface molecules) using Searchlight™ arrays. Cytokines whose concentration in the present conditions was consistently below the threshold of detection of the assay (LIF, IFNα, GM-CSF, IL-1α, IL-1β, IL-9, IL-12p70, IL-13) were excluded from the analysis because we could not rule out that significant changes may have occurred with treatment that could not be detected due to the limit of the assay sensitivity. In addition, we excluded IL-2 because it was impossible to distinguish the endogenous levels produced by IL-2 stimulated cells from the circulating exogenously administered recombinant IL-2. The serum concentration of 61 % of evaluable factors changed significantly after one dose of IL-2 (36/59) (Table 3). Similarly, 56 % of the evaluable soluble factors (33/59) increased significantly in concentration after 1 dose of IL-2 in the 10 patients who completed the study (Table 4). After four doses, the concentration of the majority of soluble factors studied (76%; 45/59) increased significantly (Table 5). Interestingly, the serum level of 59 % (35/59) of the evaluable soluble factors changes significantly between the 1st and after 4th dose (Table 6). While the serum levels of most soluble factors increased progressively during the 24 hours that spanned between the first and the fourth dose a smaller group including MCP-2, MIP-1β, MCP-1, NAP-2, IL-6R and Rantes decreased in concentration between the first and the fourth dose. Two factors, MMP-3 and Exodus-2 decreased 3 hours after the first dose but increased noticeably after the 4th. Although the results presented in this study are exploratory and fewer cytokine changes maintained significance after correcting the p2-value for the number of tests according to Bonferroni's method , it is likely that the changes observed are representative of true biological behavior of these factors in response to systemic IL-2 administration and a more powerful study will confirm these results by allowing a higher level of significance. Soluble Factors (pg/ml) present in the serum of patients undergoing high dose IL-2 immunotherapy were averaged before and after 1 dose of IL-2. A paired 2-tailed student t test was used to assess significance with an arbitrary cutoff of p= 0.05. Bonferroni's correction was applied to the data set by correcting for a total of 59 soluble factors (IL-2 was not factored in); IL-2 levels were included as internal control (*) since these values reflect in part administered human recombinant IL-2. Soluble Factors (pg/ml) present in the serum of patients undergoing high dose IL-2 immunotherapy were averaged before and after 4 doses of IL-2. A paired 2-tailed student t test was used to assess significance with an arbitrary cutoff of p = 0.05. Bonferroni's correction was applied to the data set by correcting for a total of 59 soluble factors (IL-2 was not factored in); IL-2 levels were included as internal control (*) since these values reflect in part administered human recombinant IL-2. Soluble Factors levels were averaged across 10 patients after 1 and 4 doses of IL-2. A paired 2-tailed student t test was used to assess significance with an arbitrary cutoff of p= 0.05. Bonferroni's correction was applied to the data set by correcting for a total of 59 soluble factors. We then classified the various factors according to their pattern of expression in response to IL-2 by applying unsupervised hierarchical clustering . We limited this analysis to the 47 cytokines whose concentration levels were significantly altered after the 4th dose (Figure 1). Hierarchical clustering ranks experiments according to their proximity to each other taking into account the entire data set. This unsupervised analysis separated individual samples into three groups that matched the time of collection. In fact, samples obtained before treatment, those obtained after 1 dose and those after 4 grouped together with the exception of the sample obtained from patient 16 after the first dose that clustered with the pre-treatment samples. Analysis of the three categories of samples suggested that soluble factors in serum of patients treated with IL-2 belong to four categories according to their pattern of expression. A first category demonstrated a slight increase after the first dose and stabilized for the duration of the study (Black bar, Figure 1). A second group was characterized by an increase that occurred only after the fourth dose (Blue bar, Figure 1). A third group increased rapidly after one dose but concentrations decreased by the fourth dose (Orange bar, Figure 1). Finally, a last group increased in concentration after the first dose and progressively continued to increase after the 4th (Red bar, Figure 1). Unsupervised Hierarchical clustering (Kendall's Tau) of serum samples from RCC patients obtained before, after 1 and 4 doses of IL-2 (720,000 IU/kg). Hierarchical clustering  was applied to the data set encompassing 46 cytokines significantly expressed (excluding IL-2) between before and after 4 doses of IL-2 across 10 serum samples (P2,3,4,5,9,12,13,14,15,16) obtained before, after 1 and after 4 doses of IL-2 (720,000 IU/kg). Values corresponding to soluble factors concentration in pg/ml were transformed in natural log (LN) values, average corrected across experimental samples and displayed according to the central method for display using a normalization factor as recommended by Ross . Patients' serum samples clustered according to the three time points of IL-2 administration. Expression of soluble factors segregated in 4 distinct kinetic profiling. Black bar = soluble factor minimally changing from before to after 4 doses; blue bar = soluble factor expression enhanced at 4 doses only; orange bar = soluble factor expression enhanced after 1 dose; red bar = soluble factor expression enhanced at 1 and 4 doses. The majority of changes in the circulating soluble factors tested occurred after 4 doses of IL-2 (Blue bar Figure 1 and Figure 2). 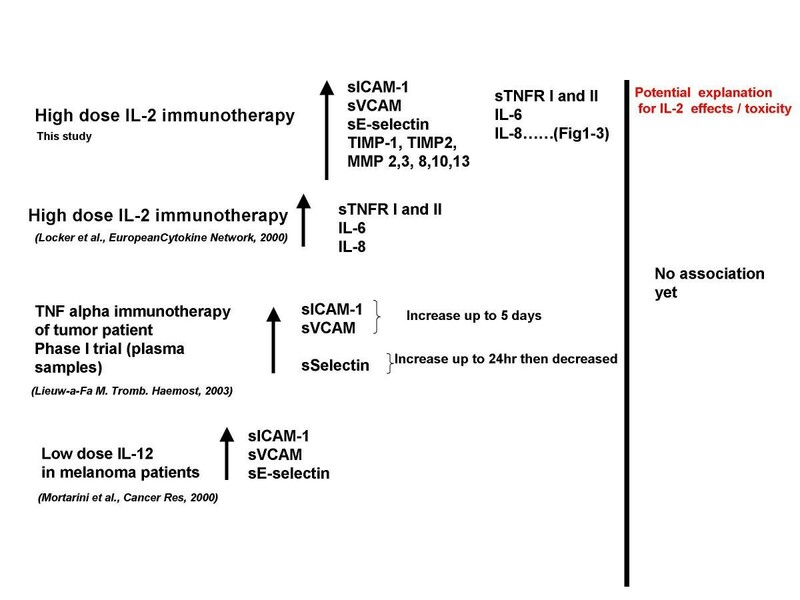 In addition a large cluster of cytokines progressively increased from before therapy throughout IL-2 therapy (Figure 3). We observed several markers of systemic and vascular inflammation whose exact function in vivo remains to be elucidated (Figure 4). 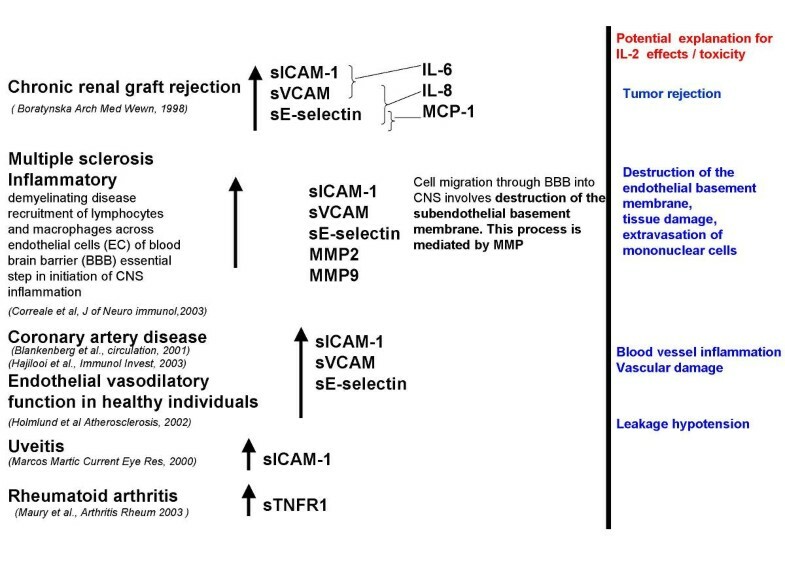 The soluble form of adhesion molecules ICAM1, V-CAM, E selectin have been reported to be similarly elevated in the serum of chronic renal allograft rejection patients , multiple sclerosis and Lupus (([23, 24], coronary artery disease [25, 26], endothelial vasodilatation , immunotherapy of tumor patients with TNF alpha  and immunotherapy of melanoma patients with IL-12  (Figure 5). Our findings may suggest similarly to these reports not only that circulating soluble adhesion molecules play a major role in the inflammatory reaction induced during IL-2 administration  but that they may be associated to the toxic effects of IL-2 (blood vessel inflammation, vascular damage, leakage, hypotension). Soluble factors increasing after 4 doses of IL-2 Soluble factors increasing after 4 doses of IL-2 clustered in figure 1(blue bar), were averaged across 10 patients. Values represent concentrations in (pg/ml) ± SD. Soluble factors increasing after 1 and 4 doses of IL-2 Soluble factors increasing after 1 and 4 doses of IL-2 clustered in figure 1(red bar), were averaged across 10 patients. Values represent concentrations in (pg/ml) ± SD. Soluble Adhesion molecules in serum as markers of systemic and vascular inflammation: correlation with high dose IL-2 immunotherapy and other inflammatory diseases. Increased levels of soluble adhesion molecules (sICAM, sVCAM, sV-Selectin, sTNFRI) and metalloproteinases (MMP2, MMP9) have been described in a variety of inflammatory diseases and believed to act as markers of endothelial cell (EC) activation. Potential explanation for IL-2 effects and toxicity in relation to the effects noted in the reported inflammatory diseases, are listed on the right of this panel. Soluble Adhesion molecules in serum as markers of systemic and vascular inflammation: correlation with high dose IL-2 immunotherapy and other therapies. The presence of increased expression of soluble adhesion molecules (sICAM, sVCAM, sV-Selectin) detected in our study, have also been reported in the serum of patients undergoing TNF alpha and IL-12 immunotherapy. Furthermore, increased level of the inflammatory cytokines (IL-8, IL-6) and soluble TNF receptor (sTNFRI) confirmed previous findings in patients receiving high dose immunotherapy with IL-2. Metalloproteinases (MMP) 2, 3, 10, 13, tissue inhibitor of metalloproteinase (TIMP1), macrophage derived chemo-attractant (MDC) and thymus and activation regulated chemokine (TARC), Lymphotactin, secondary lymphoid tissue chemokine (Exodus2), and interferon inducible T cell alpha chemo-attractant (I-TAC) were also on average increased after 4 doses of IL-2. The presence of high levels of MMP is in line with the inflammatory process previously described by us at the genomic level  and general outburst of cytokines following IL-2 stimulation. In fact, MMP are involved in matrix destruction and regeneration, mononuclear phagocyte migration and function as regulatory proteins by promoting the activation and/or degradation of cytokines. High serum levels of MMP 2 and 9 have been reported in inflammatory diseases of the central nervous system and in particular in MS patients and play a leading role in the evolution of demyelinating lesions((. We could thus hypothesize that the presence of high levels of circulating MMP following IL-2 therapy (after 1 and 4 doses) may be responsible for destruction of endothelial basement membranes, extravasation of mononuclear cells and more generally accumulation of toxic byproducts (Figure 4). In addition, it suggests a key involvement of mononuclear phagocytes activation in the IL-2-induced inflammatory process  since these cells are major producers of MMPs. Interestingly, tissue inhibitor of metalloproteinase (TIMP1) was also highly expressed after 4 doses. Although the concomitant presence of MMP2 and TIMP1 is not surprising since TIMP1 is the natural inhibitor of MMP2 and MMP9 (which we find particularly increased after 1 and 4 doses), the concurrent dramatic increase of these two factors may reflect an inhibitory feed back mechanism limiting the magnitude of IL-2 induced inflammation. It is also possible that TIMP1 at such high doses may increase cell proliferation and metabolic activity as previously reported . Elevated MDC and TARC, Lymphotactin, Exodus2 and I-TAC supports the presence of a strong migration signal for monocytes, NK cells and T cells as described by us at the RNA level  and of a potent mobilization of innate and acquired mechanisms of immune defense. 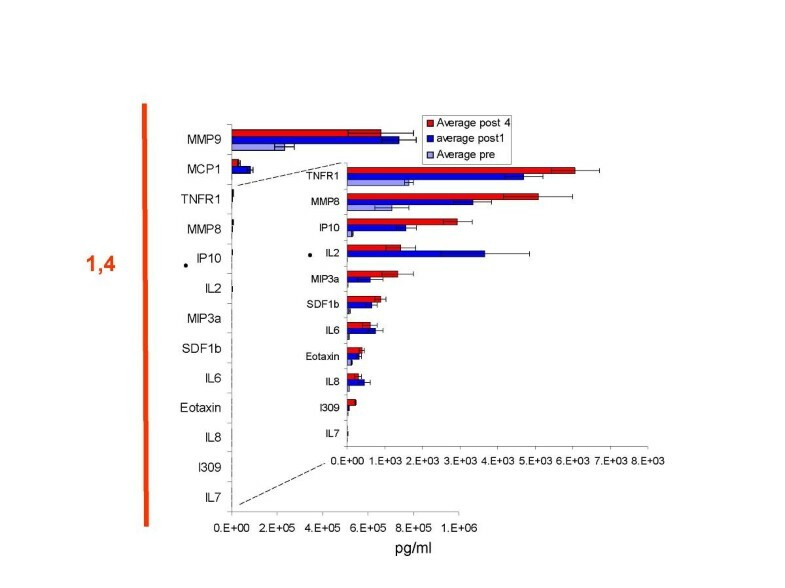 Among the soluble factors that increased significantly after 1 dose and either remained elevated or increased further in concentration after 4 doses (Figure 1 Red bar), were a group of potent inflammatory chemo-attractants for monocytes and lymphocytes (MCP-1, MIP-3, IP-10, I-309, stromal derived factor (SDF1)), eosinophils (eotaxin), the soluble TNF R1, the cytokines IL-6, 7 and 8. The high concentrations of soluble TNFR1 in patients undergoing IL-2 therapy are very striking. Circulating levels of TNF-α and sTNFRI have been reported to be significantly increased in rheumatoid arthritis patients with amyloidosis as those without  (Figure 4) and after IL-2 therapy  (Figure 5). Thus this soluble receptor may be yet another important player in enhancing the overall IL-2 inflammatory process. The persistence/increase of these factors throughout the first 24 hours of IL-2 administration (1–4 doses) may suggest that these early response proteins are the true initiator of many of the IL-2 immune enhancing effects. On the other hand, sustained release/accumulation may be the results of soluble receptor saturation and the initiation of a cascade of toxic byproducts. An additional finding was the identification of two sub-groups of patients who seemed to produce different amount of cytokines in response to IL-2; a smaller group (including patient 9, 13 and 16) appeared to produce less cytokines compared with other patients. This is a finding similar to what was previously noted in a small in vitro analysis of PBMC stimulated with IL-2 . This finding if corroborated by larger patient series may have important implications in separating patients who respond or do not respond to therapy. The number of patients tested was too small to correlate patterns of expression of various factors with the toxicity experienced or the clinical outcome of their treatment (data not shown). In summary, this pilot study identified different patterns of production of cytokines during IL-2 therapy that may be of relevance to clinical outcome and toxicity if studied in larger patient populations. In addition, patients' variability was noted with some patients appearing to be more prone to produce cytokines in response to IL-2. Immune polymorphism(s) affecting individual responses to immune stimulation could be at the basis of this phenomenon . Therefore, further studies should include not only collection of serum samples for serum analysis but also of DNA for genetic analysis. Based on this analysis, we propose a prospective collection of serum samples in a larger cohort of patients undergoing IL-2 administration with the purpose of discerning patterns predictive of clinical outcome and toxicity. Sixteen patients with metastatic RCC were recruited at the Carolinas Medical Center (Charlotte, NC 28203) to receive standard high-dose (720,000 IU/Kg) IL-2 (Proleukin, Chiron, Emeryville, CA). Serum was collected prior to treatment from the 16 patients, three hours after the first dose in 15 patients and 3 hours after the first and the fourth dose in 10 patients (Table 1). Toxicities and laboratory abnormalities are reported according to the CMC common toxicity criteria in Table 2. Fifty to 60 ml of peripheral blood were collected at the bedside in BD Vacutainer™ plus (plastic) serum tubes (BD cat # 367820) before (Pre) and 3–4 hours after 1 (1D) and 4 (4D) doses of IL-2. The complete collection was successful in 10 individuals. Pre and 1D collections were obtained from an additional 5 patients. Serum was immediately separated to avoid protein degradation, stored upright for 10 minutes and centrifuged at room temperature in a horizontal rotor at 3,500 rpm for 8 minutes. The serum phase was then transferred to a 50 ml conical tube (BD, falcon # 352098) pooling serum from 2 to 3 separator tubes and subsequently aliquoted (1 ml/vial) in cryogenic vials (Nunc cat #363401, St Pleasant Prairie, WI). Serum aliquots were snap frozen in dry ice and stored at -80°C until use. Protein serum levels were assessed on protein-based platforms (Pierce SearchLight Proteome Arrays, Boston, MA). These arrays consist of multiplexed assays that measure 16 or more proteins per well in standard 96 well plates. The arrays are produced by spotting a 2 × 2, 3 × 3 or 4 × 4 patterns of different monoclonal antibodies into each of a 96-well plate. Following a typical sandwich ELISA procedure, signal is generated using a chemiluminescent substrate. The light produced at each spot in the array is captured by imaging the entire plate with a commercially available cooled CCD camera. The data are reduced using image analysis software that calculates exact values (pg/ml) based on standard curves. Each sample was tested for the following 68 human proteins: monocyte inhibitory protein (MIP)-1α; MIP-1β; monocyte chemotactic protein (MCP)-1/CCL1; MCP-2/CCL8; MCP-3/CCL7; MCP-4/CCL13; macrophage inflammatory protein (MIP)-3β /CCL19; MIP-3α /CCL20; exodus2/CCL21(similar to MIP3α); thymus and activation regulated chemokine (TARC/CCL17); I-309/CCL1; eotaxin/CCL11; macrophage derived chemo-attractant (MDC/CCL22); interferon inducible protein 10 (IP10/CXCL10); stromal derived factor (SDF1)-beta; lymphotactin/XCL1; leukocyte Inhibitory factor (LIF); rantes/CCL5; monokine induced by gamma interferon (MIG/CXCL9); ITAC; TNFα; IFNγ; IFNa; GM-CSF; ENA-78/CXCL5; Gro-A/CXCL1; neutrophil activating protein (NAP)-2/CXCB7; vascular endothelial growth factor (VEGF); angiotensin (Angio)-2; ciliary neuronotrophic factor (CNTF); fibroblast growth factor (FGF)-basic; keratinocyte growth factor (KGF); hematopoietic growth factor (HGF); heparin binding epidermal growth factor (HB-EGF); platelet derived growth factor PDGF-BB; thymopoietin (Tpo); tissue inhibitor of metalloproteinases (TIMP)1; TIMP2; matrixmetalloproteinase (MMP)-1; MMP-2; MMP-3; MMP-8; MMP-9; MMP-10; MMP-13; interleukin (IL)-1α; IL-1β; IL-2; IL-4; IL-5; IL-6; IL-7; IL-8; IL-9; IL-10; IL-12p70; IL-13; IL-12p40; IL-15; IL-16; IL-18; tumor necrosis factor receptor (TNFR)-1; TNFR2, interleukin-6 receptor (IL-6R); ICAM1; VCAM1; E-Selectin/CD62E; L-Selectin/ CD62L. Eight of these factors (LIF, IFNα, GM-CSF, IL-1α, IL-1β, IL-9, IL-12p70, IL-13), were found to be below the limit of detection in all conditions tested and were removed from the data set prior to statistical analysis because we could not determine with certainty whether changes in their expression occurred below such a threshold. Paired two tailed t test was used to determine the level of significance in serum concentration changes for the remaining 60 soluble factors at different time points. IL-2 was included in the analysis as an internal control. Differences were considered significant at an arbitrary cut off p2-value of ≤ 0.05. Significance was also assessed after correction for the number of tests performed applying the Bonferroni's correction to 59 soluble factors (IL-2 was not considered among the tested variables since it was not possible to discern the respective contribution to serum concentration of exogenously administered or endogenously secreted IL-2). Relatedness in cytokine expression patterns at different time points of IL-2 treatment was tested with unsupervised by applying Eisen's hierarchical clustering methods  to the data set encompassing the 45 cytokines and the 10 samples (P2,3,4,5,9,12,13,14,15,16, Figure 1). This tool ranks experiments according to their proximity to each other taking into account the entire data set. We thank Christine Burns, Amy Wilson and Linda Lavigne at Perbio for their technical support in processing Searchlight™ arrays.